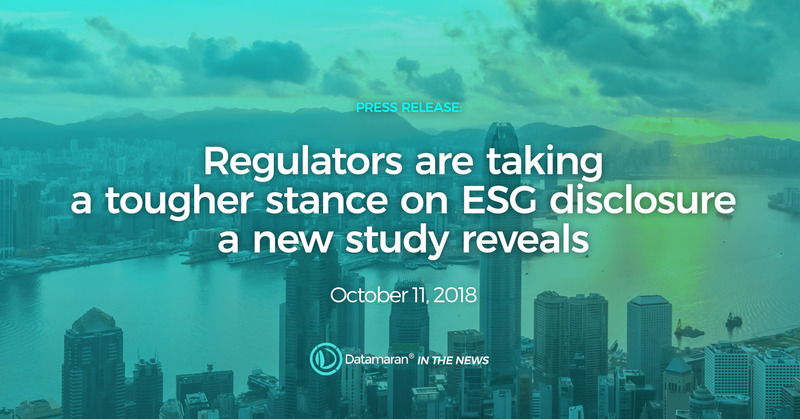 A new study by Datamaran - the leading solution for non-financial risk management - reveals a tougher stance by regulators on ESG-related disclosure. LONDON - 11 October 2018 - Regulators are taking a tougher stance on ESG disclosure, a new report by Datamaran - the leading solution for non-financial risk management - reveals. In the last three years alone Environmental, Social and Governance (ESG)-related regulations - grew by more than 100 percent across the United Kingdom (UK), The United States of America (US), and Canada, indicating that ESG regulatory landscape is evolving fast. For some sectors, such as Utilities and Healthcare and Pharmaceuticals, the majority of sector-specific regulations published after 2015 are mandatory. The sharp rise in ESG regulations together with a tougher hand from policymakers send a strong signal to business to - ESG issues require mainstream attention. Datamaran CEO and Co-Founder Marjella Alma explains further: “Business needs to be aware of emerging ESG regulation. The tougher stance taken by regulators means that companies who are not integrating ESG issues into their strategy and their risk analysis will have a harder time navigating the complex and evolving regulatory landscape. The message is clear, non-financial issues are a ‘must have, not a nice to have’”. Focusing on Healthcare and Pharmaceuticals, Utility and Financial Services sectors in the US, UK and Canada, Datamaran’s Global Insights Report 2018 analyzes international, regional and national mandatory regulations and voluntary initiatives published between 2012 and 2018. The report found that sector free regulations grew by 158 percent in the UK (from 31 to 80 regulations), by 145 percent in the US (from 29 to 71 regulations) and Canada (from 22 to 54 regulations). Social and Environmental topics are becoming more prominent in these recent regulations. The most regulated topics are Energy Use in the US Utilities, Product and Service Safety across all regions in Healthcare and Pharmaceuticals, and Business Ethics in the Financial Services across all countries. There has also been growth in regulation on Climate Change in the Financial Services Sector and Consumer Rights in the US Utilities Sector. Datamaran’s Global Insights Report 2018 is available here. For an interview with Marjella Alma please contact Saskia Ligteringen at saskia@datamaran.com or on +44 2077029595. Datamaran is the global leader in Software as a Service (SaaS) solutions for non-financial risk management. Datamaran enables a business process for continuous issues monitoring fully owned by the sustainability and risk teams. It harnesses technology to support decision-makers with an improved materiality analysis process – one that seamlessly integrates into Enterprise Risk Management (ERM) and corporate strategy. Datamaran’s global clientele of blue-chip companies have replaced the dated and expensive manual processes used for benchmarking, materiality and non-financial risk analysis as well as issues monitoring. The insights Datamaran users gather are used across multiple business teams (governance, risk, compliance, sustainability) to identify and monitor risks and opportunities and to inform corporate strategy. If you would like to learn more about Datamaran please email saskia@datamaran.com or call on +44 2077029595.